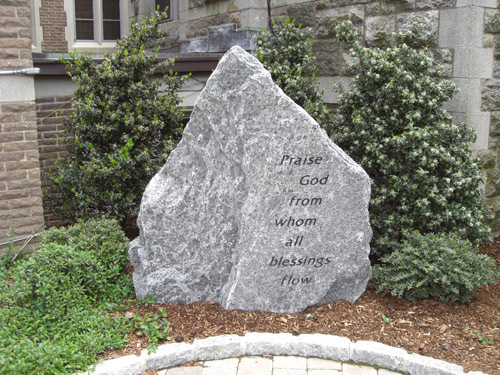 Our Mission Statement ~ First Congregational Church of Stamford (United Church of Christ), is an inclusive Christian community dedicated to following and sharing the teachings of Jesus Christ, encouraging spiritual growth through worship, education, and outreach. We welcome and celebrate individual interpretation of our faith in covenant with God. ▪ Nurtures spiritual growth in ways that speak to a changing world. ▪ We believe in the one living and true God, perfect in power, wisdom, and love, revealed to us as our Creator by Jesus Christ, God’s Son. ▪ We believe in Jesus Christ, the Son of God, who in his life, suffering, death, and resurrection manifested God’s love for all, and showed the way of redemption through the repentance for and the forgiveness of sin. ▪ We believe in the continuous presence and leadership of the Spirit of God in the Church and in the world. ▪ We accept the Bible as the supreme revelation of God’s nature and will for us, and as a source of our knowledge of Jesus Christ, the foundation of our faith. ▪ We grant to one another liberty of individual interpretation of the deep mysteries and teachings of the Bible and the Church, only requiring that, as members of this church each shall strive to live in the spirit and according to the teachings of Jesus Christ. ▪ We believe in the essential unity of Christendom, and we labor for the fuller realization of the kinship of all people in the worldwide Dominion of God. We affirm that Christ is our Savior, and rejoice that we are all one family. Our Open and Affirming Statement ~ No matter who you are or where you are on life’s journey, you are welcome here. First Congregational Church of Stamford (United Church of Christ) is in discernment and transition after a period of changes. Guided by these principles, as a congregation we voted in 2007 to demonstrate our commitment to loving our neighbors and to rejoicing in all people as the family of God by declaring ourselves to be an Open and Affirming congregation. By God’s grace, we seek to be a congregation that includes all persons, embracing differences such as but not limited to sexual orientation, gender identity, marital status, gender, age, and mental and physical ability, as well as racial, ethnic, or social-economic circumstances or background. We welcome all people, no matter who they are, no matter where they are on life’s journey, to share in the life and leadership, ministry and fellowship, worship, sacraments, responsibilities, and blessings of participation in our congregation. Almost 400 years old, we are among the oldest gathered churches in the U.S. and founder of the city of Stamford. Our history informs who we are today. We are passionate about helping people to experience the love and peace of God in every aspect of their lives. The generations of our congregation have endured the Revolutionary War, Civil War, World Wars, and those wars of our modern era, and have continued to be strong through the Great Depression and other economic crises. As a congregation, we have inherited a legacy of resiliency, courage, conviction, and grace. It is no accident that this church has inhabited 6 different church buildings over the generations. We are a community capable of change in a changing world. Our faith is grounded in what God has done for the world through Jesus Christ. As part of the United Church of Christ, we value social justice as a primary part of our faith formation. As a Congregational Church, we value the autonomy of each congregation and each believer. In this era of paradigm shifts and changing cultural mores, when the mainline church is suffering diminution, we seek to be relevant and meaningful for our own generation as we carry the timeless message of the Gospel. We pray to co-create with God the next period of vital ministry and service to the world. We aim to work for justice, to love mercy, and to walk humbly with God (Micah 6:8). Love is our core value.